Spurs left back, Benoit Assou-Ekotto’s World Cup descended into farce this week as Cameroon were humiliated 4-0 by Croatia, sending them crashing out of Brazil 2014. As time expired, Assou-Ekotto was involved in a heated argument with Benjamin Moukandjo which ended up with the fullback head-butting his own teammate. Cameroon had long since lost the game, after a terrible performance that included former Arsenal player, Alex Song, aiming what looked like a Karate chop at Croatia’s Mario Mandzukic. In this context, you could write off the Spurs player’s behaviour as a one-off mistake but this is just the latest in a series of unsavoury incidents. First came the arguments with former coach, Andre Villas Boas, which saw the Cameroon player loaned out to QPR. Supposedly the two fell out last summer, despite Assou-Ekotto’s initial enthusiasm for the Portuguese. It seemed a brave move by AVB at the time, as this left Spurs with only one specialised left back, the relatively untested Danny Rose. Then came an outburst on social media after Spur’s 5-0 defeat at home to Liverpool. 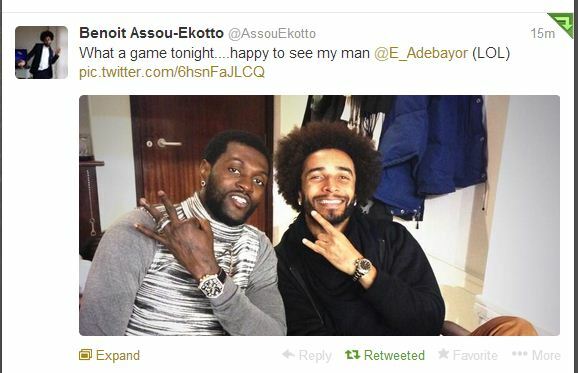 Assou-Ekotto tweeted “What a game tonight….happy to see my man @E_Adebayor (LOL).” along with a picture of him and Adebayor – who had also been ostracised from the first team – celebrating Tottenham’s misfortune. Worse was to follow. 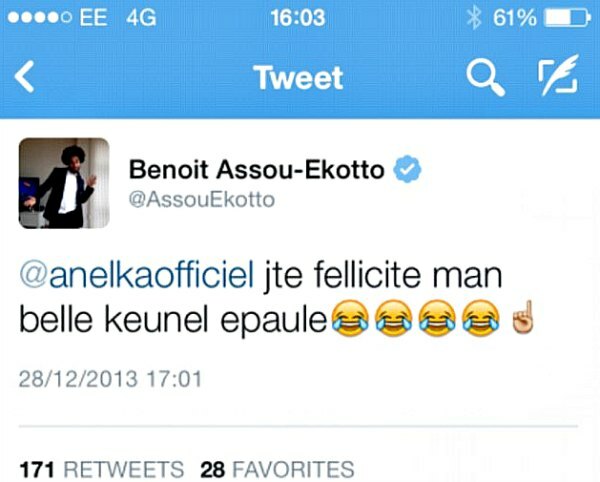 When Nicolas Anelka made the controversial “Quenelle” gesture whilst playing for West Bromwich Albion, Assou-Ekotto was quick to offer enthusiastic support on Twitter. His tweet roughly translates from the French as “I congratulate you on the beautiful quenelle”, leaving little room for ambiguity. He was charged by the FA but has since seemed unrepentant. Tottenham clearly need a decent left back. Last season, Danny Rose emphatically demonstrated he is not up to the task. This has led many supporters to suggest a return for Assou-Ekotto. I have to admit I didn’t watch many QPR games last year, however, by all accounts the Cameroon international had a fairly poor season. He certainly has not had a good World Cup. There are plenty of good left backs that Spurs have been linked with. At this tournament Ricardo Rodriguez and Daley Blind have impressed. Celebrating Tottenham’s humiliating defeat demonstrates a total lack of respect for his fellow players and Spurs fans. Supporting Anelka shows, at the very least, a lack of judgement, especially given Tottenham’s history. It’s time to get rid of the Cameroon international. This latest incident just confirms it, Assou-Ekotto should not play for Spurs again. Should Assou-Ekotto be in Pochettino’s plans for next season? Which left back should Spurs sign? Please let us know your opinion in the comments section below. This entry was posted in General Thoughts, World Cup and tagged Assou-Ekotto, Benoit Assou-Ekotto, Brazil 2014, Cameroon, football, Headbutt, Spurs, thfc, World Cup on June 21, 2014 by Jon @ AnythingButPenalties. Don’t forget the fight with Corluka during a game (sorry but i completely forgot which one). Just looked it up, it was against Stoke. Thanks for reminding me.